Vantage’s two major shareholders, Asian Investment Management Services (“AIMS”) and Platinum Asset Management (“Platinum”) jointly hold some 53% of the shares in the Company. The largest groupings of shareholders are in Australia (50%) and Europe, including the UK (19%). As at 1November 2013, there were 247,314,532 million shares in issue. 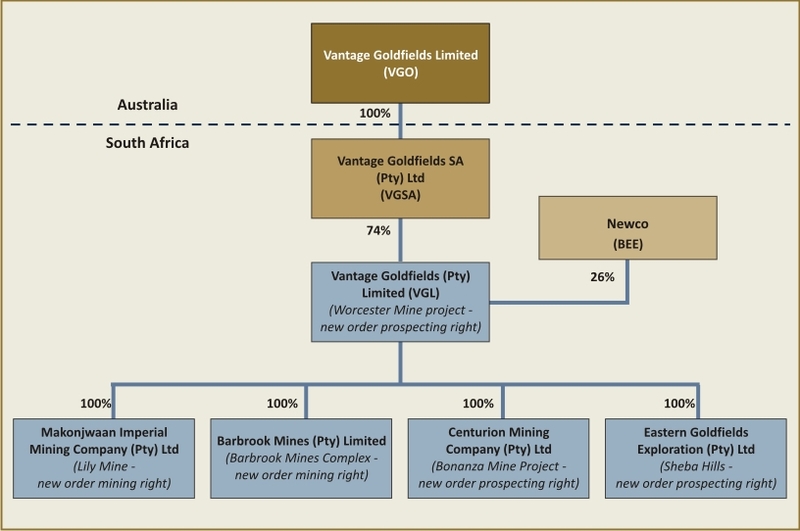 Legislation in South Africa requires historically disadvantaged South Africans (“HDSAs”) to own interests in South African Mineral Rights, through a regime known as Black Economic Empowerment. Under this legislation, HDSA’s were required to hold at least a 15% ownership interest in South African Mineral Rights by 30 April 2009 and a 26% ownership interest by 30 April 2014. To meet these requirements Vantage partnered with Lomshiyo Investments (Pty) Limited (“Lomshiyo”) in February 2006, a company which includes the local community and Vantage’s workforce as shareholders. Currently, Lomshiyo has a 26% indirect ownership interest in the Barbrook and Worcester Projects and a 15% indirect ownership interest in the Lily Project (See BEE & Mining Legislation).